Enhancing greening in the downtown Minneapolis area is a continued focus of the 2025 Plan. Today’s 21st Century Cities remain competitive by having green spaces and public realm areas where residents, workers and visitors alike can enjoy. 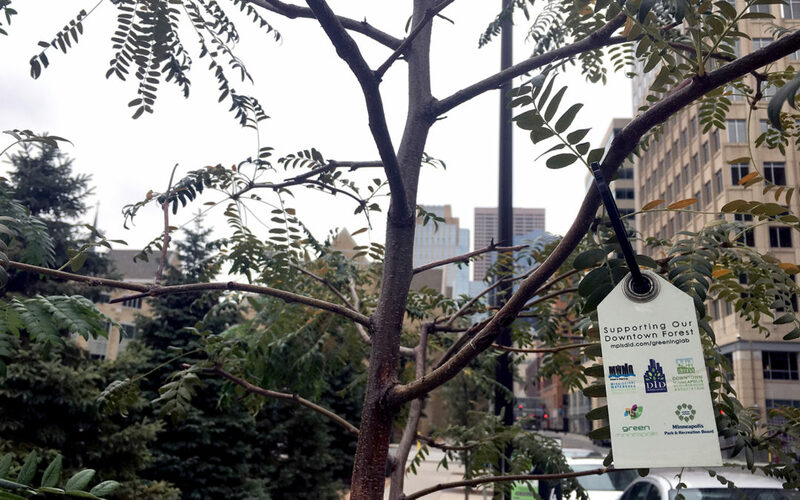 Greening Lab is working to help add to downtown’s green landscape. The Greening Lab Project, a partnership between the Mpls Downtown Improvement District and Green Minneapolis with support from the City of Minneapolis, Downtown Minneapolis Neighborhood Association, Minneapolis Park & Recreation Board and Mississippi Watershed Management Organization, is focusing its attention and resources on Minneapolis’ downtown forest. Because of how it is impacting downtown Minneapolis, Greening Lab was selected as one of this year’s 2025 plan leadership award winners. It will be recognized on October 2 at the mpls downtown council annual gala. For many years, the pattern downtown was for street trees to be planted, not become established, and need replacement within a matter of years. Greening Lab is pursuing a variety of tactics to break that cycle. Starting last year, all new trees within the center of downtown are either irrigated or receiving weekly watering. In addition, the growth and health of these trees are being tracked every year through a tagging system. New techniques for retrofitting trees that are in grates into planting beds are also being implemented in an effort to support tree health and greener streets. As part of the 2025 plan, several of the 10 main initiatives focus on adding greening. The most direct initiative is to “create and sustain a green infrastructure—and showcase the riverfront,” but greening also intertwines in reaching our downtown development goals, transforming Nicollet into a must-see destination, creating a consistently compelling downtown experience, creating a Gateway connection, and building our transportation infrastructure into one of the nation’s leaders. Greening Lab’s efforts this year have helped enhance downtown’s green space while also paving the way for future maintenance and growth.